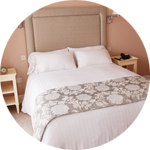 The Devonshire Hotel is a bed and breakfast run by a friendly family in Hornchurch. We pride ourselves on providing high service standards and quality food for hotel guests. 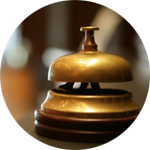 We strive to offer each and every guest feeling refreshed and well looked after, no matter whether you're staying for business or pleasure. We offer a restful stay for disabled guests with wheelchair access and disabled facilities such as disabled WCs, and we can cater for coeliacs on request as well as for those with dairy-free, gluten-free, wheat-free and soya-free alternatives. We serve delicious and healthy homemade daytime snacks and morning breakfast for hotel guests, helping you to start the day just right. You're sure to leave feeling de-stressed and relaxed as each of the rooms at The Devonshire Hotel feature Hypnos luxury hand made mattresses, stunning décor and beautiful en-suites. The striking building that houses our boutique hotel close to Romford, Dagenham, Upminster and Elm Park was built more than 100 years ago as an Edwardian villa. An elaborate, historically sensitive, six month renovation of the property was completed in February 2011, keeping many of the stunning original features from the villa, and also coupled with stylish and luxurious interiors designed to give you a comfortable and relaxing stay. NEARBY CENTRAL LONDON AND ESSEX. For visitors and business guests wanting close proximity to Romford centre, Upminster, Rainham, Dagenham, Essex, East London and Central London, you'll be glad to know that the Devonshire Hotel is within easy reach of the A127, A12 and M25. We're just a 5 minute short walk from the Hornchurch Station of the London Underground (District Line), giving you excellent links to all parts of London. There are also plenty of attractions locally including a golf course, country parks, pubs, shops, the busy Hornchurch High Street, restaurants and shopping centres ("Lakeside" in West Thurrock, "The Brewery" & "The Liberty" in Romford), so there is always something to do. 5min walk from Hornchurch Underground Station. 5min walk from Hornchurch High Street. Plenty of shops, restaurants, pubs & bars within walking distance. Breakfast & all day snacks. Free limited on site parking with CCTV. Dry cleaning service (ask reception). En suite bathroom/showeroom with power shower. Flat LED TV with Freeview & DVD player. 100% Egyptian cotton linen & towels.